You are probably not getting enough fiber in your diet. When most people think about fiber, they think about bran muffins, prunes, maybe even tree bark, but fiber can be much tastier than those things. There are two types of fiber, soluble and insoluble, these are your dietary fibers. Soluble fiber can lower blood cholesterol and your risk for heart disease. Insoluble fiber can lower your risk of diverticular disease. Fiber helps other foods to move through your dietary tract easier and smoother. They also help you to feel fuller for longer, so you will eat less. You need about 30 to 38 grams of fiber daily. You can incorporate fiber into your diet by eating the following foods. Black beans are a good source of anthocyanins which is an antioxidant that can help reduce your risk of heart disease. They are also known for their protein content. They are known as a plant protein and are good for your health. They contain 15 grams of fiber per one cup. Your recommended serving size is only one cup. Not only do these fruits contain fiber, but they contain antioxidants and vitamin C. You can eat these in any way. If you want to eat them raw, do it. If you want to make a smoothie, do it. No matter what, you will get some of your needed protein from these berries. Raspberries contain 8 grams of fiber per cup. Your recommended serving size per sitting is one cup. 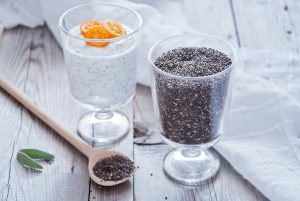 You should sprinkle these seeds in overnight oats, salads, yogurt, smoothies, or add them as thickener in hamburgers or meatballs. These seeds are super absorbent and chock full of fiber and omega-3 fatty acids. Omega-3 fatty acids can help reduce inflammation and combat against heart disease. Chia seeds contain 8 grams of fat per 2 tablespoons. Your recommended serving size per sitting is 2 tablespoons. Like all vegetables, broccoli is low in calories. It is high in folates, which can protect against GI cancers. Broccoli also contains vitamin K, which is a source for healthy bones. You can eat this fiber rich food any way you want. You can have it raw, cooked, on pizza, whatever you want. You can even substitute it as a side instead of french fries. Broccoli contains 5 grams of fiber per cup. The recommended serving size, per sitting, is 1 cup. Not only do sweet potatoes contain fiber, but they also contain potassium and vitamin A. These are both vital nutrients for a healthy body. Vitamin A gives your immune system a boost, while potassium helps your muscles. Sometimes, potassium can offset the effects of sodium on your blood pressure. There are 4 grams of fiber in every cup of sweet potatoes. Your recommended serving size is one cup per sitting. Apples only contain 4 grams of fiber, but the other nutrients that they contain make them a contender on this list. Apples contain antioxidants and vitamin C. The skin is where the fiber is found. If you want to eat this fruit for its fiber, make sure that you are keeping the skin on. You will get about 4 grams of fiber for every medium sized apple that you eat. Avocados are known for being heart healthy, but they also contain five grams of fiber. If you add half an avocado to your lunch, you will feel more satisfied throughout the day. You can put this fruit in any food that you eat. It can be incorporated as a spread, as a slice on a burger, or even diced and thrown into your salad. 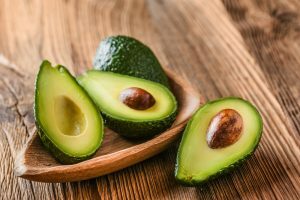 There are five grams of fiber in each half of an avocado. Your recommended serving size is one whole avocado, giving you 10 grams of fiber. Although quinoa is known as a pseudo-grain, it contains a good punch of fiber. It contains 5 grams of fiber per cup. It can be used as an addition to meals like stir fry, burgers, or be put into a stew. You also get 8 grams of protein from one cup of quinoa. This pseudo-grain has double the benefits. Your recommended serving size per sitting is one cup. You can get about half of your recommended daily fiber intake by eating a cup of lentils. Lentils not only contain fiber, they also contain magnesium. You should not fill up on fiber in one go. Be careful to only eat one cup or less of lentils at a time. If you eat two cups, for example, it will kick your digestive system into high gear. You should be eating about 5 grams of fiber spread out throughout the day. There are 15 grams of fiber in 1, cooked, cup of lentils. Your recommended serving size, for the whole day, is only one cup of cooked lentils. Fiber is good for your digestive system and should be incorporated into any healthy diet. It is important for your nutrition to have enough fiber in your diet. It will help your body to process foods in the best, and easiest, way possible. You do not want to overdo it, as you will spend most of your time on the toilet if you do. Make sure that you are eating about what the recommended daily fiber intake is for your weight, height, and age. Talk to your primary healthcare professional before you begin a new diet. They will be able to help you work out a plan that will be the most beneficial to you. A healthcare professional is the best person to talk to if you are planning on adding more fiber into your diet. If you believe you are having any problems after you start a new diet, consult your primary healthcare professional immediately.